This article is based on the book Platform Scale, written by Sangeet Paul Choudary. Platform Scale is available for free download for a limited period between October 5th and October 9th. To access additional bonus content, check the book website here. The on-demand economy is bringing together technology and freelance workers, to deliver us services in exciting new ways. We are increasingly using our cell phones as a remote control for the real world. Every week, we see a new platform come up that connects consumers with freelance labor. New companies are forming in almost every service vertical. But not all these companies clearly understand what determines success and failure of on-demand business models. There are two critical factors that will determine the success of a company in the on-demand economy: multihoming costs and interaction failure. In computer networking parlance, mutihoming refers to a computer or device connected to more than one computer network. In the world of platforms, this notion is an important one. If your producers and/or consumers can co-exist on multiple platforms, you face a constant competitive threat. Eventually, it may be difficult for clear winners to easily emerge. Multihoming costs are relatively high for developers to co-develop for both Android and iOS. Multihoming costs are high for consumers also because of the cost of mobile phones. Most consumers will own only one. However, multihoming costs for drivers to co-exist on Uber and Lyft are relatively low. Most drivers participate on both platforms. Given the ease of booking rides, multi-homing costs are very low on the consumer side as well. In a previous article on TechCrunch, I had elaborated in detail how multi-homing could be prevented by creating long-term stored value within the platform. For on-demand platforms, this is important because multihoming allows producers (service providers) to co-exist on multiple platforms. With a limited supply of service providers available, this can lead to interaction failure. Interaction failure happens when the producer or consumer (or both) participate(s) in an interaction, without the interaction reaching its logical, desired conclusion. Imagine a merchant setting up a listing on Ebay that never gets any traction, or a video enthusiast uploading a video on YouTube that fails to get a minimum number of views. Quite often, these outcomes could be the result of poor quality listings or videos, but they could also be owing to the platform’s inability to find the right matches. Producers and consumers who experience interaction failure get discouraged from participating further and abandon the platform. If reverse network effects set in, this can eventually lead to an implosion of a platform. In the initial days, interaction failure regularly leads to the chicken and egg problem. To understand these phenomena better and how they could impact your platform, I’d recommend this post on reverse network effects and this one on the chicken and egg problem. Interaction failure is especially important for on-demand platforms. Imagine a consumer requesting for a service and the service never arriving. Imagine, in turn, a producer receiving a request, preparing to fulfill that request, only to find that the request gets cancelled. In both cases, the consumer or the producer may decide to abandon the platform. This is exactly what Uber had in mind when it waged its war on Lyft. Unethical as that was, I’d like to focus on that to glean lessons for building the next Uber for X. In some of the largest cities we see drivers drive for both Uber and Lyft, and other competitors. It’s not uncommon for these drivers to switch between the two platforms multiple times a day. With a limited supply of drivers in a city and the cost for a driver to connect to an additional platform so small, we see drivers multihoming on both Uber and Lyft. This has naturally led to intense competition between the two companies and Uber infamously resorted to a playbook to create interaction failure on Lyft using questionable tactics. Uber decided to target interaction failure on Lyft, by contracting third party employees to use disposable phones to hail Lyft taxies. Before the Lyft taxi arrived at its pickup location, the Uber contracted employee would cancel the ride. With so many cancelations on the Lyft platform, drivers would become frustrated driving for Lyft and, in some cases, switch over to Uber. Lower drivers would lead to further frustration for consumers as they would have to wait longer for their requests for cabs to be fulfilled, eventually spurring them to abandon the platform. This loop is illustrated below. When multihoming costs are low, producers and consumers will connect to many platforms. With multiple platforms sharing the same producers and consumers, it is difficult for a business to build defensible networks. Thus, it is difficult for a clear winner to emerge in the market. With many platforms operating and defensibility low, interaction failure becomes a key factor in determining long-term winners. If you’re building the Uber for X, you need to ensure that you’re tracking a metric that helps you determine the degree of interaction failure on your platform. Freelancers that don’t get business within X days, requests that don’t get satisfied within Y minutes, may all be indicative of interaction failure. The exact measure of interaction failure will vary by platform and the importance of tracking interaction failure will, in turn, depend on the multihoming costs. About the author: Sangeet Paul Choudary is the author of the book Platform Scale, available for free download for a limited period between October 5th and October 9th. He also writes the blog Platform Thinking. What is the single most important innovation that Facebook ever came up with? Before I answer that, let’s think of the real value for users on a social network. Social networks are a classic example of the platform business model where users create all the value and there is very little value until users come on board. Real value for every individual user, then, is the value that his network is capable of creating. Most communication and networking products have never truly succeeded in capturing this value on an ongoing basis. E.g. I might be connected to a lot of users on a communication product but I need to be actively engaged in a conversation to benefit from these connections. This is why the News Feed is Facebook’s most important innovation. It allows users to constantly benefit from the surge of activity in their network neighborhood. It’s a stalker’s delight, a lurker’s guilty pleasure. But the News Feed is the single most important innovation that changed social networking from a user-centric to a network-centric activity. It changes the use case for an entire product category. Post the News Feed, social networking was no longer about staying connected with a friend or even with a group. For the first time, social networking was about staying connected with one’s entire network. The News Feed represents a leap in the evolution of online communication and networking products. Online communication and networking have traditionally been transactional in nature. Email has always been a transactional product. Chat is transactional as well. We use these products only when we want to engage in an actual exchange (of information) with someone else. Early social networks were built along the same lines. Imagine the days of Orkut, Bebo and, even, MySpace. Social networking, back then, was an extension of the existing communication models around email and chat. You typically logged on to connect with friends. If you didn’t want to connect with friends, you just never logged on. The dominant use case on these social networks was transactional. The News Feed changed that! It moved social networking from a transactional use case to an engagement-driven use case. Engagement products need to provide a minimum guarantee of activity to keep the user engaged. Transaction products, in contrast, need to ensure liquidity and the assurance that the user can complete a transaction conveniently. If you think of Facebook pre-News-Feed, users used the platform largely to communicate with others. The News Feed shifted value in the platform from mere connections (and communication) to content (and engagement). By no means is the news feed the only determiner of engagement on Facebook. The decision to allow developers to build out an app economy on top of Facebook and the creation of social use cases on top of Facebook (most notably gaming and gifting), clearly helped the engagement cause. However, across all initiatives that Facebook ever took, the one that has been most persistent and that eventually took over as the default home screen – the first ‘feature’ that a user is exposed to on every log in – is the news feed. In traditional social networking, the feature that the user kept returning to was his own profile, with some notifications alerting specific network activity. This is why having the News Feed as the default Home Page is rather important. 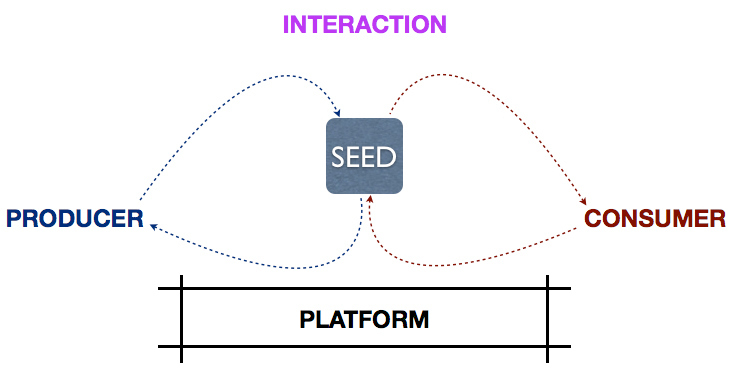 It changes social networking from a user-centric to a network-centric activity. The News Feed embodies the very concept of the network effect. It shows that the network effect isn’t simply a function of the number of other nodes you are connected to but also of the nature of the links that connect you with them. A user’s past interaction with other nodes is a great determiner of the strength of ties between nodes. A real world network would have certain ties stronger than others. The news feed captures this and creates a user-centric view of the network. This is also why I believe Facebook deserves credit for pioneering the news feed. An activity stream or news feed like feature was already present in Twitter, and before that, on Flickr. But these never gave an accurate representation of the network and were at best, mere activity streams aggregating the activity at neighboring nodes. There was no focus on the nature of the link with neighboring nodes. This is where Facebook’s focus on optimizing the news feed algorithm creates a more accurate representation of one’s network than ever before. One might argue that the news feed also creates a stronger network effect. With traditional social networks, you could have a few hundred friends but it was arguably the same 10 friends bringing you back to the platform. This meant that losing those 10 friends to another platform could signal the need for you to make the move as well. With the news feed, a stream from a much wider circle of friends constantly hits you. When the central use case shifts from communication with individual friends to interaction with the overall network (via the news feed), it could potentialy make the network more resilient to a situation with reverse network effects. Moreover, this doesn’t apply only to social networks. Any business model which relies on user-generated content can benefit from a well-architected news feed. Even marketplaces, which have traditionally been transactional, are creating engagement with a news feed. If you’re building a networked product, think of what embodiment of the network can be delivered to the user. The News Feed is brilliant because it takes a user’s network and individual actions and builds out something that results when the two are superimposed on each other. This is exactly how our social experience works in the real world. Our world is shaped by a consequence of the actions that we take with our environment. None of that is, of course, simple enough to be replicated through a mathematical model. But the news feed is a great approximation. How social networking moved from a transaction-first to an engagement-first model.Tweet This. How to build products that deliver value from network effects. Tweet This. The one feature that transformed social networking forever. Tweet This. Design principles for building products that capture network effects. Tweet This.